Loyalty Man may be Queensland Carnival bound after an impressive performance at Sandown on Wednesday, the lightly raced and promising three-year-old a determined winner of the Browns Handicap at only his second run back from a spell. A horse who has always shown plenty of promise, the well related son of champion stallion Fastnet Rock did not win by a wide margin but it was the style of his victory that really caught the eye. Making his run early in the straight, Loyalty Man put a bit of ground on his rivals at the 200m only to lose concentration, allowing others to get to his girth. But once he realised he was in competition he fought hard, holding off the challengers and looking to have plenty in hand on the line. "I thought he was going to win by a bit more than he did but once he got to the front he pricked his ears and had a good look around," Michael Moroney said. "But he fought back strongly which is good." Jockey Jake Bayliss, who was riding Loyalty Man for the first time, was wary of letting his charge get to the front too early but the horse was always travelling well just behind the leaders. "He put a length and a half on them but then wanted to have a really good look around. When they came up on the side of him he pinged again." "He is a nice horse with plenty of raw ability," he continued, "and he still has a lot to learn." Moroney agreed, noting that the stable would take him "one race at a time." "But if he can get to Saturday class that would be great and we possibly might head to Queensland." 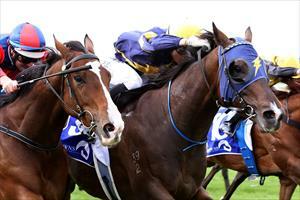 "He is still learning," Moroney said, adding that he has been a more tractable horse since being gelded. "We had a bit of trouble with him as a colt, we tried to keep him that way as he is well bred but it got to the stage where he was unworkable." A 2014 Magic Millions purchase for Paul Moroney, Loyalty Man is out of the imported Group One winner Imperial Beauty who has also produced the Group placed French galloper Ipswich. Thanks to Darryl Sherer for the winning photo.